After hearing rave reviews, i nudged a few friends to watch Kumki. Alas, it was not to be, we were at the theater, Inox, waiting for the doors to open when a staff came over to tell us there was some technical issues and the screening was cancelled. Our hopes fell and we were disappointed. Anyways, that weekend an excolleague of mine called asking if i would like to catch up, and what do you know, it began with us watching Kumki, at Escape Cinemas, Express Avenue. I had seen and enjoyed Director Prabhu Solomon's earlier movie Mynaa, which is set in the village and is very rural. Wondered if maybe this movie too would be similar. There ends the similarity. The setting was the only common factor between the two flicks. The scene where we are introduced to Komban and his rage is quite disturbing. He is all set to trample Alli [Lakshmi menon] when she slips and just about escapes. One day when heading back to base after a brief spat with the officials after Bomman fails to show Manickam's papers [which his uncle had lost somewhere along the way], the man who helps them Mani annan receives a call from the village asking if the Kumki elephant is ready to be transported to the village. As real as the visuals are, i felt the director could have shown more scenes of Manickam and his antics, and of Kumban as well. The songs are beautiful, especially Sollitaale Ava Kaadhala ,Ayyayayo Anandhame and Onnum Puriyalai. The romance is sweet, the pride the villagers have of their property and heritage is amazing. Vikram Prabhu has done an amazing job, for a debut artist. 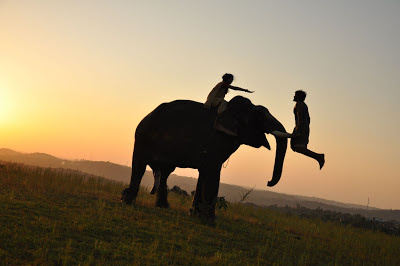 The scenes where he cajoles and pampers the elephant, the push ups he does on its tusks, wow... shows the relationshiop between a mahout & his elephant. Lakshmi Menon fits the role perfectly and has played her role well. Thambi Ramaiah is wacky as always, and infact i felt he got more screen space than others. A movie worth a watch.... yet another offbeat story..